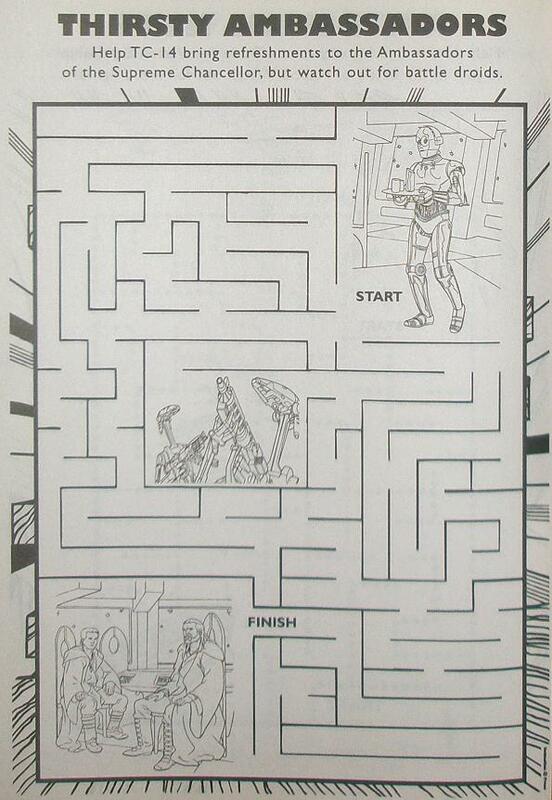 Here is one of the more seemingly reasonable mazes they could include in the activity book. This maze is related to the scene right at the beginning of Star Wars I: The Phantom Menace when Qui-Gon and Obi-Wan were sent to negotiate with the Trade Federation to end the blockade around Naboo. Does anyone in the Star Wars universe like protocol droids? It’s entirely reasonable for this maze that the droid might need to navigate a maze like ship to get from point A to point B, but why would the protocol droid need to avoid the battle droids? Aren’t they on the same ship programmed to be on the same team? It doesn’t seem like the battle droids just go off and do what they want without orders. Some of the mazes include something to be avoided, but this one it doesn’t seem to make any sense for the person to have to avoid battle droids who are supposed to be on the same team. I guess even other droids find the protocol droids annoying.